I have a dilemma. I have one vote, and my political position most closely aligns with Ron Paul. However, currently he is at 5.3% at the poll’s, which could indicate that unless a miracle happens, he probably will not win this election. Which is not to say that it could not happen, I firmly believe in miracles. My dilemma then is this: Should I vote for the candidate who I am most closely aligned with (Ron Paul) just out of principle, or should I use my one vote and throw my weight behind someone who is more likely to win so that those that I do not want to win have less of a chance? I think that there are many, many like me and are thinking the same way. I think that there are enough people out there that would vote for who I am voting for, but they are in the same dilemma, thinking that if they vote with their conscience they will not be doing any good, when in reality, if everyone voted with their conscience the right person WOULD win. What it comes down to is this, we should all just quit playing the game. We should all just vote for who we think will do the best for the country and then let happen what will happen. That is what I am choosing to do. I am going to vote with my conscience this year. My first act in this year of voting my conscience is to proclaim that I am voting for Ron Paul. I encourage you to vote your conscience as well. Who ever that may be, vote for them. It does not matter what their current percentage of votes is. It matters what they stand for and what they will do. Whatever you do, VOTE, and VOTE AMERICAN!!! 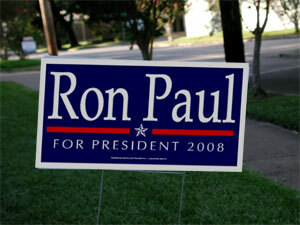 Those of you who support Ron Paul, make sure you Get a Ron Paul Sign.